Cosmic Chaos for Nintendo DS. Pacific Resources for Education and Learning (PREL), in collaboration with Mentor Interactive, has released Cosmos Chaos! an educational game for the Nintendo DS console that targets vocabulary learning in science, social studies and mathematics. Resulting from a U.S. Department of Education grant focused on the development, delivery, and evaluation of a supplemental vocabulary instructional game for Nintendo DS, this digital game-based vocabulary enrichment program is designed to increase 4th grade struggling readers’ word knowledge and use of word learning strategies to help improve comprehension. Capitalizing on the ubiquitous use of games by children and youth in society today, the emerging use of gaming in education offers an approach that is completely different from common technology applications in school environments. Cosmos Chaos! provides an immersive game environment in which players are active participants in their learning. 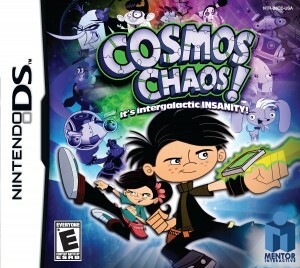 Instructional content and an engaging virtual experience have come together in Cosmos Chaos! to create an innovative educational game. Cosmos Chaos! strives to go beyond simply creating an electronic version of school; instead, it creates an environment in which the player participates in a mission to save their pet dog, Hugo, and stop the evil Dr. Z and his sidekick robot, the maniacal Mr. Muffins, from taking over the galaxy. As the player engages in this quest, he or she interacts with words and learning strategies. By embedding strong learning principles and educational goals in the areas of fantasy, rules/goals, sensory stimuli, challenge, mystery, and control, the design of this role-playing game (RPG)/adventure hybrid is activated within an instructional context to not only enhance, but promote, the player’s learning process. In recent research studies, Cosmos Chaos! has been shown to be effective at improving students’ vocabulary knowledge. Scientifically based research demonstrated that 4th grade students using the game in after school settings were able to increase their vocabulary knowledge, in many cases significantly. Cosmos Chaos! was piloted by 644 students in the San Diego Unified School District, as part of an independently conducted random control trial. The vocabulary of students in all sectors had improved beyond that of students who did not play the game. Vocabulary improvements among those whose first language is Spanish were notably higher. Cosmos Chaos! is currently available where games are sold.